Marshall Middle School has earned the prestigious honor of being a National Demonstration Site for the college readiness program AVID, or Advancement Via Individual Determination. Of the 285 middle schools in Los Angeles County, only six other middle schools share this distinction. The school was lauded for multiple qualities, including staff and administrative leadership focused on student success, rigorous classes, a college-going culture, a record of using student performance data to improve achievement, a pattern of exceeding state expectations on tests, and a clean and well-maintained environment. Students unveiled the school's official AVID banner during a recent ceremony at Open House night in the Marshall auditorium. 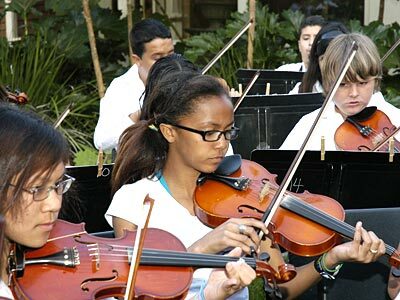 The event began with the student orchestra playing classical music in the flower garden. Students then participated in a Parade of Pennants displaying the names of colleges that they plan to attend. The school's hallways display street signs reflecting a college-going culture: Phi Beta Kappa Avenue, University Way, Ivy League Circle, Career Corridor, and Collegiate Canyon Row. Each classroom is named after a college or university, selected by the teacher. Displays of college information throughout the school help students learn more about college options. A Seeds of Success room offers college-logo items donated from top colleges and universities throughout the nation. Students earn these items by exhibiting high academic performance. Learn more about the AVID program at www.avid.org. AVID MUSICIANS -- Marshall Middle School students performed at Open House recently to celebrate the school's prestigious designation as a national demonstration site for AVID, a college readiness program.